Many countries around the world have a national bird, from the bright and beautiful toucan in Belize, to the tremendous falcon of Hungary (not to mention the mighty Wood Pidgeon in Britain), but no other bird around the world has the symbolism and cultural importance of the Andean Condor. One of the largest birds in the world, the pair living in Berlin is an impressive addition to the Zoologischer Garten. Trumped only by some varieties of pelican and albatross, the Condor is one of the largest flying birds in the world with an average wingspan of 3m or greater, and often weighing in at over 10kg, depending on gender. 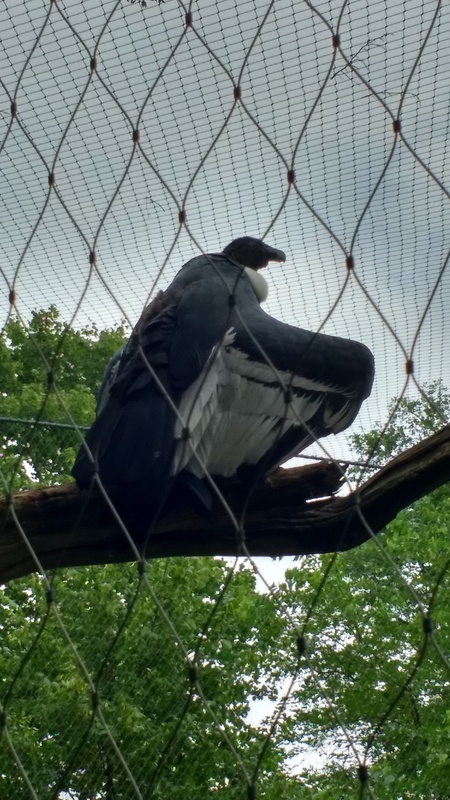 Unusually for birds of prey, the male Condor is almost invariably larger than the female, and can reach an incredible 16kg at largest, making them the heaviest bird in the world. The plumage is an imposing black, with a white ruff and tail feathers, although the males tend to have far more pronounced plumage. The males have a distinctive red comb on their head, and like the turkey, tend to form a wattle about the throat as they age. It is one of 7 species of New World Vultures, only two of which are designated as Condors (the other being the highly endangered Californian Condor), and like the classic Old World Vultures of Africa and Western Asia, the Andean Condor rarely hunts, instead scavenging for carrion. The vulture’s distinctive hooked bill for rending putrid flesh, and the bald head which prevents potentially infectious pieces of rotting meat from being caught in the plumage and harming the bird, are both found in the Condor, however, unlike their Old World cousins, the Andean Condor has an extremely sensitive sense of smell, which it uses to find new meals, while the Old World Vultures use almost exclusively sight. The talons on the Condor are also underdeveloped and blunt, a result of years of feeding on prey that is already dead, and making their capacity for finishing off weaker prey fairly poor. Found throughout eastern South America, from Bolivia and Venezuela in the north and winding all the way down (you’ve guessed it) the Andes, the Condor has inhabited the same rolling highlands and open hunting plains that were the cradle of human civilization on the continent some 5000 yeas ago. In the Incan culture, the Condor was considered a servant of the sun, and the only bird strong and powerful enough to carry spirits to ‘Hanan Pacha’ or the upper world, where the sun and moon resided. When Pachakuti united the Incan tribes from his throne in Cusco, he stressed the importance of the sun god Inti, even over the previous father god Wiraqucha; indeed the next emperors of the Incan Empire would claim lineage from the sun god, and thus the Condor was launched into a position of great importance in the culture, and many artefacts depicting the Andean Condor survive today. Even now, the Condor is the symbol of vast swathes of South America, seen as the national bird of Argentina ,Bolivia, Chile, Columbia and Ecuador. They represent health and power, and are the subject of many local festivals and ceremonies. In Peru, sometimes a Condor is strapped to the back of a bull during a bullfight, allowing the bird to slowly claw the bull to death during the battle; a symbol of South America’s supremacy over the Spanish colonizers. Luckily, in this ceremony, the Condor is normally unharmed and is later released, but some rituals explicitly involve clubbing the animal to death, which is a terrible shame for such a long-lived bird (current holder of the oldest bird record and possessing a lifespan often over 50 years long), particularly when they must also contend with increasing destruction of habitat and secondary poisoning from the carcasses they eat. I hope that in the future, the Condor will continue to be treated with the respect and reverence it has earned in the last few thousand years, and continues to dominate the skies of the Andes. 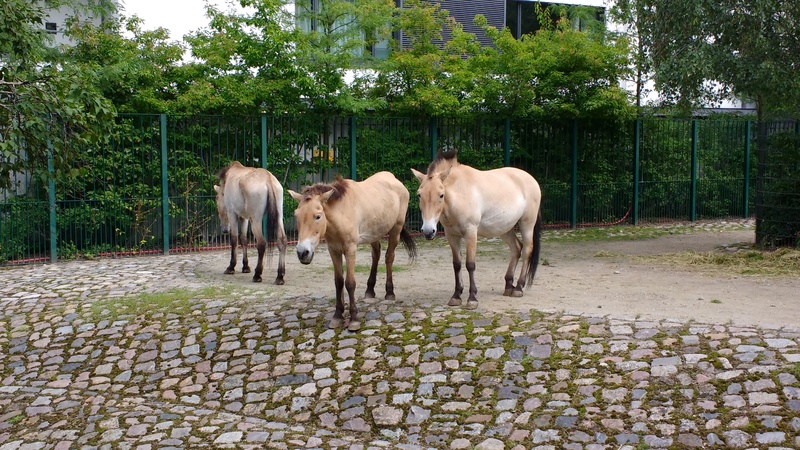 The Berlin Zoologischer Garten has one of the largest and most extensive night houses that I’ve ever seen. Not content to simply fill a room with thousands of flitting bats, they display an exciting array of interesting nocturnal animals from all over the world, terrariums filled with aardvarks, spring hares, blind moles, gerbils and, most impressively, a Javan Slow Loris. The Javan Slow Loris is a small arboreal mammal, around 600 grams in weight, with long brown and cream coloured fur, which form up in a distinctive forked band running down its back. It gets its name from its slow, deliberate movements, lifting itself from branch to branch at an almost leisurely pace, which displays the Loris’s strong grip and unique muscle structure that allows it to hang from branches with little effort (similar to the locking grip of sloths, a better known soporific mammal). This slow movement however, doesn’t mean that the Loris has nothing to fear in it’s native jungles, rather using its slow and steady pace to move through the night in almost perfect silence, becoming totally still when approached by a predator, and capable of surprising bursts of speed when in danger. Perhaps most interesting of all, the Javan Slow Loris, and indeed all Slow Loris, are capable of giving a toxic bite, a rare feature among mammals which is mainly seen in various kinds of shrew and vampire bat. A small gland on the arm of the Loris creates this toxin when mixed with the Loris’s saliva, not only allowing it a nasty bite, but also allowing the toxin to be groomed into the fur of juvenile Loris’ by their mothers, providing extra protection against opportunistic predators. Due to the nature of the Night House, I was unable to take a picture of Berlin’s native Slow Loris, but I can provide a stock image. The Javan Slow Loris, as its name might suggest, is endemic to the South East Asian island of Java in Indonesia, where the thick tropical jungles suit their arboreal lifestyle. 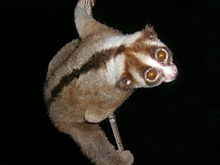 The Javan Loris was originally classified as a Sunda Slow Loris, but small differences in size, fur length and geographical location lead to its reclassification. The are omnivorous, moving almost 20m up through the Javan canopy, eating fruits, bird eggs, small insects and reptiles, and even native cocoa beans (making them mutual lovers of chocolate with humans). They are totally nocturnal, relying on their large eyes and excellent sense of hearing for navigation, and stay curled up on branches during the day, often in pairs or larger groups, forming adorable collection of sleeping fluff balls hanging from the canopy. Unfortunately, the Javan Slow Loris is considered critically endangered, in no small part do to their illegal trade as ‘exotic’ and interesting pets. They are easy to capture during the day as they hang from trees and their slow movement is desirable to pet owners. They are not, however, easy to keep, and pet Loris often become stressed and diseased without the correct care, and additionally, many Loris have their teeth pulled in order to prevent their toxic bites from affecting their ‘loving’ owners, which only adds to their suffering. Deforestation of the Java also contributes to the Loris’s decline, as (like the Giant Panda) the Loris is too slow moving to make it through the increasingly fragmented jungles, effectively isolating populations from each other. In light of their critical position and vulnerability as an endemic species, it was a real treat to see such a healthy Loris so close, and I hope that breeding and conservation programs between institutions like the Berlin Zoologischer Garten helps to alleviate the stress the species is under.